Not too many astrologers are looking at Bitcoin, the leader of the upstart pack of "crypto-currencies" that threatens to throw the banking establishment into pandemonium. The few that are seem to have settled on this chart, that of the "Genesis Block" which marks a sort of "first breath" for the currency. The Bitcoin price seems to respond very strongly to transits against this chart (see this). I haven't seen a strong case for using another chart. Depending on how wide the orbs we use, this may be a "perfect" libertarian chart (like these). Pallas is trine (and ruled by) Mercury which is conjunct North Node, and her declination is so extreme as to be quite literally "off the chart". I haven't studied extreme declinations much but might venture to guess that the libertarian factor is even stronger than the Mercury-Node connections would already make it. If we extend the orb of the quincunx aspect to four degrees (I haven't found sufficient reason to do this, despite evidence that Pallas responds to wide orbs and minor aspects), then we have a quincunx with Pluto. Even then, the Mercury-Node connections (perhaps with help from the extreme declination) would probably overcome the Pluto aspect. Whether Bitcoin lives or dies, I don't expect it to become a tool for "The Man". In the realm of more traditional astrology, the chart has many more extremely striking features. The Sun-Mars-Pluto triple conjunction in Capricorn is quite the stunner. 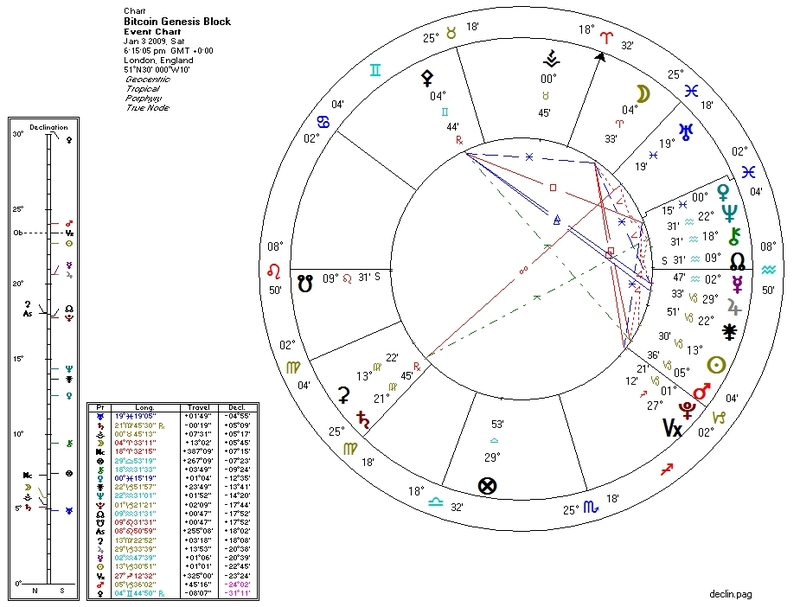 This chart is all business, and its business is revolution: like the goddess Kali to whom Pluto is often compared, the potential is to bring death, complete transformation, and rebirth. In the Sixth House, this trinity suggests a revolution in the systems and processes of everything it touches. Perhaps this also suggests that Bitcoin itself may undergo a number of deaths and rebirths. The Uranus-Saturn opposition echoes the overall sentiment, suggesting the breakup of existing structures and institution of new ones. The financial indicators for the chart are complex and varied. On one end, Venus in Pisces conjunct her ruler Neptune points to an attitude that value, and its monetary representative, is essentially illusory. It foreshadows the extreme price fluctuations to come, and also hints at the capacity dissolve the perception of what value is for all of us. On the other end, Saturn lives in the Second House of money, solidifying a new structure of value. The Second House itself is ruled by Mercury which is conjunct the North Node: the long term mission here is to comprehend, build, and solidify value. Venus, incidentally, is at her farthest point from the Sun in the synodic cycle and accordingly at her brightest in the visible sky. All charts contain a near-infinite amount of data to be teased out by an astrologer. Part of the game of interpretation is figuring out what the most important points are, and focusing on those. With that, I'd like to close this brief survey with a look at the Nodes. The placement here is, like many other features of the chart, quite extreme. For all its disruptive and emancipatory potential, the North Node in Aquarius on the Descendant tells us that Bitcoin does not work alone. It is completely dependent on its partners: its developers, its entrepreneurs, its investors, and its users. It is we who will determine if Bitcoin will sink or swim. Disclosure: I am holding some Bitcoin.